Empty Escape is another point and click room escape game developed by Daily Escape Games. In this game, you have to use your logic and brain to escape from the room. 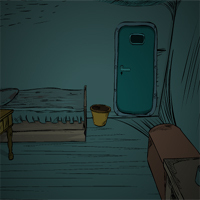 The storyline of the game is rather simple - you are imprisoned in a small room. The door is locked and the only way to escape is to use different tools to make your way out. Everything in the room is connected to each other . Remember that only few people can complete this difficult quest and escape from the empty room. The empty room escape game is rather tricky game and require a lot of time to solve all puzzles.